Tile floors are beautiful and durable. And they attract dust within a short time. If you have cement, you might have an idea of how fast it gets dusty between the tiles. But you can handle this problem if you have the best tile floor cleaners in the industry today. The right product for the chore will make cleaning your tile easier and faster. So, how can you ensure that you get the best product for the job? Here is a review of the top brands and models of tile floor cleaners on the market today. Below are the top tile floor cleaners on the market today. 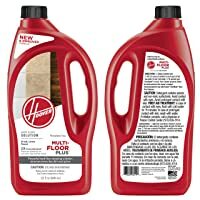 These products will come in handy when cleaning your floor. 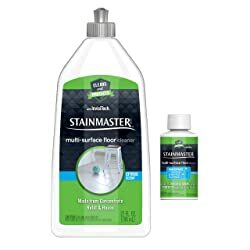 This is a cleaner for people who are on a budget. It comes in an economy size refill can and comes ready to use. You don’t need to keep guessing how to mix the product in order to get the ideal solution for cleaning your tile floor. 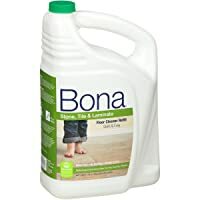 Another feature of the Bona Stone Tile and Laminate Floor Cleaner Refill is the splashless tech that provides a smooth pour. Thus, you have a product that will clean your floor and not spill over to other places in your house. Its water-based comes in handy as it dries pretty fast and won’t leave any dull residue. The product is ideal for use on terrazzo, laminate, no-wax sealed tile, stone, vinyl, and linoleum floors. 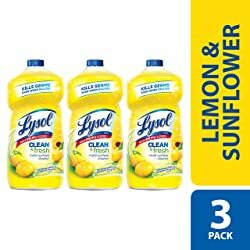 The Lysol Clean and Fresh Multi-Surface Cleaner is a great solution for cleaning your floor while deodorizing it. It is able to cuts tough grime and grease, making them loose for faster and easier cleaning. Additionally, the solution kills about 99.9% of bacteria and viruses to make your home hygienic. With this cleaner, you not only get a clean floor but a sanitized one that will be free of germs and bacteria. It also kills 99.9 percent of Staphylococcus aureus and cleans non-porous surfaces within one minute. The product is quite economical and a little will go a long way to clean your floor. And it comes from a reputable brand that has been in the industry for long. If you want to kill all germs and bacteria from your house, then you need a concentrated solution that can do the magic. This is precisely what you get when you buy HOOVER Multi-Floor Solution. 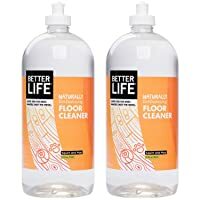 It is one of the most powerful tile floor cleaning solutions that deodorizes and removes everyday sticky messes and dirt. And the best part, it makes your floor to have a fresh linen scent that will purify the air. The product is safe to clean odors and stains on sealed ceramic tile, marble floor, laminate, vinyl, and hardwood surface. You should use the solution with a Hoover Floormate Hard Floor Cleaner Machine. Also, it is septic safe and phosphate free. Unlike most floor cleaners on the market today, this product isn’t tested on animals. It provides a delicious citrus mint smell that will make your home to be more friendly to you and your family members. And you should note that it doesn’t contain any perfume. Safety in mind, the solution is free of VOCs, petroleum, and alkylphenol surfactants. Hence, it is safe for use on your floor and it won’t damage it. You can also use it in places with kids and pets since it won’t hurt them. The product also restores the shine of your stone, vinyl, hardwood, laminate, ceramic tile, and other types of floors. So, it will not only clean your floor but also take care of it. This is safe, deep cleaner for granite, porcelain and ceramic tiles, travertine, slate, limestone, and marble floors. The solution is biodegradable and eco-friendly, making it perfect for use around pets and kids. It provides a clean floor every time you use it and you don’t need to rinse the floor to ensure that it’s spotlessly clean. That’s made possible by the non-rinse hypoallergenic formula. Very economical, you only need to use about 2 oz per gallon of water since it’s a concentrated solution. This is the only solution that you will require to ensure that all your floors are clean and taken care of. 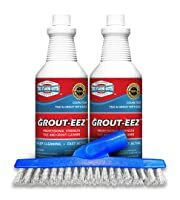 Grout-Eez is a heavy duty tile floor cleaner that easily removes all the stains, dirt and grease from your porcelain, subway, and ceramic tile. The package comes with a free brush when you buy 2 bottles of the solution. This brush ensures that you clean your floor while standing since it easily attaches to a pole. And it is V-shaped to ensure that it fits perfectly into the grout line and easily loosen grime and dirt when used with this product. One bottle of the solution will clean around 250 sq. ft. of grout and tile. So, with 2 bottles, you can clean around 500 sq. ft. and do this while standing. This is the product for all professionals. Looking for a product that will last for days and still provide the much-needed cleaning surface? 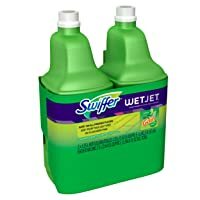 You need to try the Swiffer WetJet Spray Mop Floor Cleaner Solution. This is a great product for using on different types of floors, including tile and hardwood. The product was designed to ensure that your floor continues to shine even after many years of heavy traffic. It also makes the floor to remain clean and smell fresh for long; you don’t need to use another chemical to do this. It is also very affordable. Actually, you don’t need to break a bank to afford the solution. And that’s not all, a little solution goes a long way to clean your house. Yet another safe and deep cleaner solution for travertine, slate, granite, limestone, marble, porcelain and ceramic tile. It cleans your floor every time you use it and you don’t need to rinse after cleaning. Since it is a concentrated product, you only need to use around 2 oz of the solution, mix it with one gallon of water and start your cleaning chore. It is a great product form cleaning the hard surface floor and will ensure that they look amazing. Moreover, it is safe around pets and kids since its biodegradable and eco-friendly. Using this solution will ensure that your house remains free of germs and bacteria that can cause diseases. To create a ready to use solution, simply add water into a 27 ounces bottle and add about 3 ounces of the solution. The mixture will protect and clean your tile floor as it removes grime and dirt from the floor. With this product, you are guaranteed of enjoying your time when cleaning your house. It also comes with a surface protectant technology and invisiTech cleaning technology. The solution starts to dissolve grime immediately due to its powerful, easy, and quick formula. And with everyday use, the product will protect your floor from all future stuck-on grimes. It was specially designed to be used on stone, laminate, vinyl, and tile floors. The secret of having a long-lasting tile surface is getting rid of all debris regularly. This can mean vacuuming, dust-mopping, or sweeping daily. If that a lot of work, get a robotic vacuum cleaner to do the chore for you. Some of these cleaners even wet-mop for additional convenience. Also, always vacuum or dust your tile floor before you begin to mop it. This way, it will always look shiny after cleaning it. If your tile floor looks terrible, don’t worry, there is hope. Try tile floor cleaner solutions to revive its look. Avoid using bleach and vinegar since they can easily destroy your floor. On the contrary, you can apply a grout colorant to enhance its look. Next, if your ceramic tile is scratched, you might come across grime that is etched into the surface. Here, you only need to do a little polishing with brass polish or toothpaste. Alternatively, you can buy tile polish to improve the shine of your floor. Q: I have a tile floor. Where can I get the best cleaner to make it look shiny? A: These products are found in almost all home stores near you as well as online stores. Ensure that you buy your solution from a reputable store to get a warranty. Q: Why should I clean my tile floor? A: High traffic areas gradually get dull and they become dirt. Regular mopping will only remove the dirt from the surface and that’s why you should clean your tile floor. Q: Should I hire a professional to clean my tile floor? A: Sometimes it is advisable to hire a professional who can clean your tile floor effectively. A professional will ensure that all the stains are removed from the floor. Q: Can I use homemade products to clean my tile floor? A: Tile floors are very easy to clean and you should use neutral products when cleaning them. It is advisable to buy cleaning products to ensure that you use the right products. Q: How often should I clean my tile floor? A: You should clean your tile floor every week and even consider hiring a professional to clean them once a year. Q: How long should I wait after cleaning my tile floor before I walk on it? When you get the best tile floor cleaners, it is easier and cheaper to keep your tile floor shiny and clean. The bucks you invest in having these products while ensuring that you waste no time or effort when cleaning your floor.